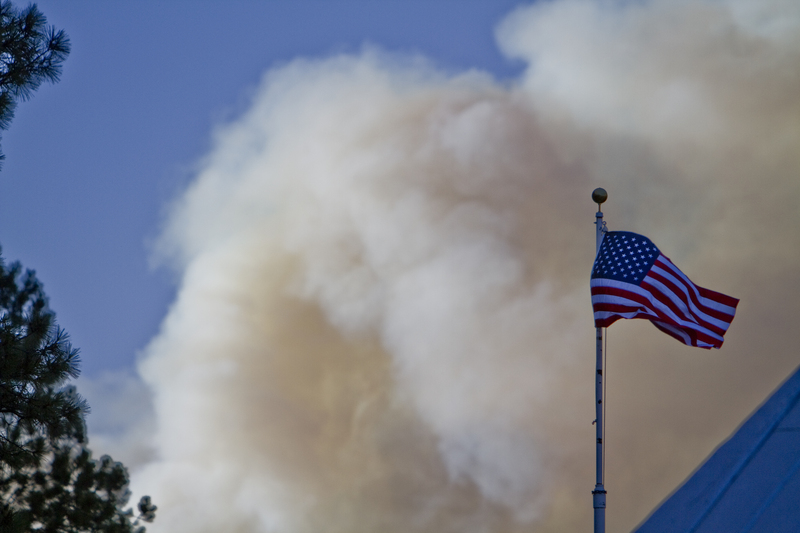 ALBUQUERQUE, N.M. Fire crews in New Mexico on Saturday fought two growing wild blazes that have scorched thousands of acres, spurred evacuation calls for dozens of homes and poured smoke into the touristy state capital. State officials said the uncontained blaze near Santa Fe had spread to 8 square miles, making it apparently the largest of several wildfires burning in the West as it placed the city under a blanket of haze. The thick smoke also covered the Gallinas Canyon and Las Vegas, N.M. The fire in New Mexico's Santa Fe National Forest is burning just 25 miles from the city, prompting the Red Cross to set up an emergency shelter at a nearby high school. Officials asked residents in about 140 summer homes to evacuate as a crew of 340 battled the flames near the communities of Pecos and Tres Lagunas. Crews also cleared out campgrounds and closed trailheads in the area as they worked to prevent the fire from moving toward the capital city's watershed and more populated areas. The state Department of Health warned residents in the Pecos, Santa Fe and Espanola areas to prepare for smoke and take precautions by avoiding prolonged or physical activity outdoors. "Potentially unhealthy conditions could occur in these communities overnight and into the early morning," a statement released by health officials said. Another New Mexico blaze, the Thompson Ridge fire near Jemez Springs, had grown to about 1 square mile, state forestry officials said. Between 40 and 50 homes in the area were evacuated as around 80 crew members and a helicopter arrived to help fight the blaze. Elsewhere in the West, fire crews worked to beat several other fires, including one in California and another in southwest Colorado. A fire in the foothills of the Angeles National Forest in Southern California threatened power lines Saturday after prompting mandatory evacuation orders in the community of Green Valley a day earlier. The evacuation order was lifted later Friday. Firefighters continued to work toward gaining control on the 3,600-acre fire with high heat in the forecast Saturday. In Colorado, Mike Blakeman, a spokesman for the Rio Grande National Forest, said a fire 15 miles southwest of the small town of Creede was reported at about noon Friday and the cause of it remained under investigation. No structures have been damaged, but three homes and several outbuildings were threatened Saturday. John Parmenter, director of Scientific Services Division at the nearby Valles Caldera National Preserve in New Mexico, told the Albuquerque Journal that the Thompson Ridge fire ignited Friday in dense territory that was scheduled for thinning in the next few years because it posed a fire hazard. "The area that it's in is very steep terrain leading up to the Valles Caldera," he said. "It could burn a lot of forest . There's a lot of fuel in there."